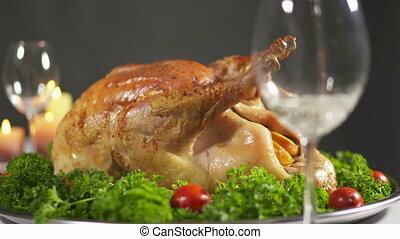 Roasted turkey serving on thanksgiving table. 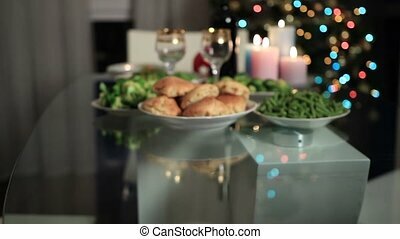 Close up of woman's hand serving roasted turkey with apples and broccoli on platter on thanksgiving table, decorated with candles and dishes. Close up of woman's hand serving roasted turkey with apples and broccoli on platter on Thanksgiving table, decorated with candles and dishes. 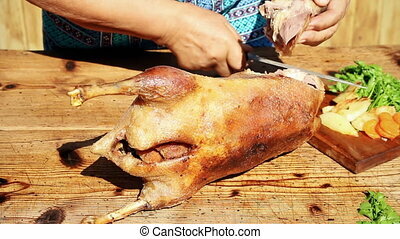 Garnished roasted Thanksgiving turkey steaming on tray. Holiday turkey with tomatoes and herbs closeup. Thanksgiving turkey dinner. 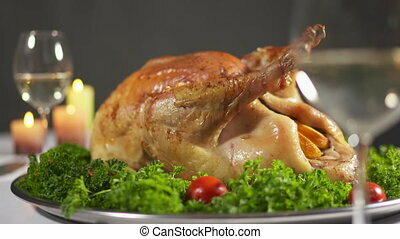 Roasted Thanksgiving or Christmas turkey steaming on tray. Burning candles in the background. Pouring white wine into wine glass. 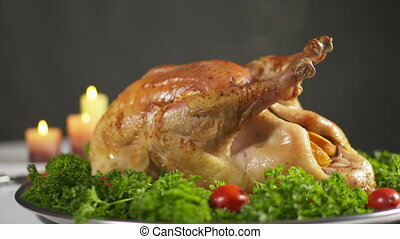 Thanksgiving or Christmas turkey dinner. 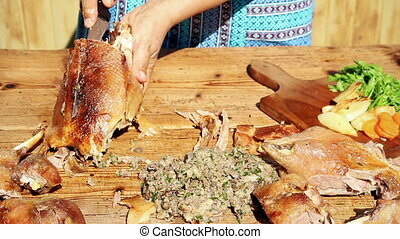 Roasted turkey steaming on tray. Homemade juicy turkey with orange tomatoes and herbs. Burning candles and wine glasses. 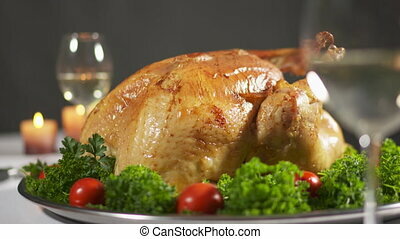 Roasted juicy turkey on tray for Thanksgiving or Christmas dinner. Steaming hot holiday turkey garnished with tomatoes and herbs. Panning right to left. Grandma serving food at a decorated Thanksgiving table. Thanksgiving or Christmas turkey dinner. 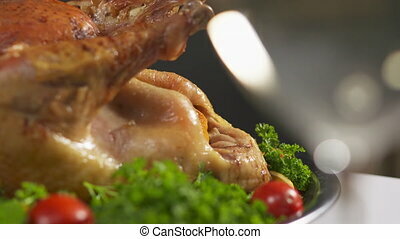 Closeup of whole roasted turkey on a tray garnished with orange, tomatoes and herbs. Turkey dinner served on Thanksgiving Day. 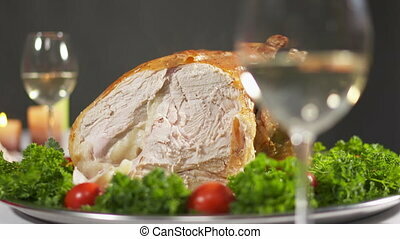 Closeup of whole roasted turkey garnished with tomatoes and herbs. Slices of juicy breast meat steaming on a plate. Panning right to left. Turkey dinner served on Thanksgiving Day. 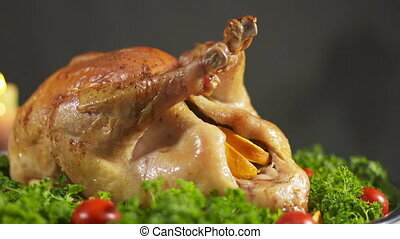 Closeup of whole roasted turkey on a tray garnished with orange, tomatoes and herbs. Defocused lights of burning candles are reflected in a wine glass. Christmas dinner. 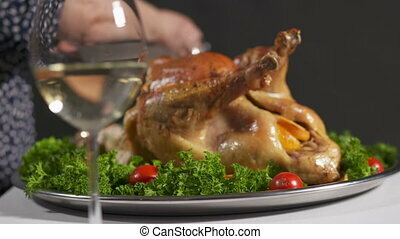 Unrecogizable man bringing roasted turkey on table. 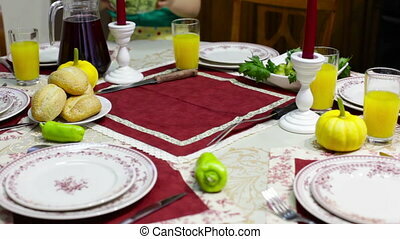 Multi generation family serving delicious dishes on Thanksgiving table decorated with candles. 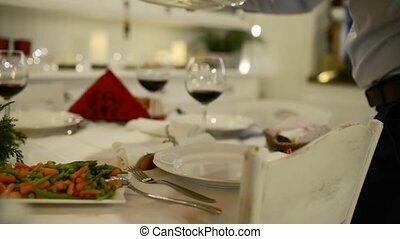 Festive table is served with different healthy dishes and wine. Family celebrating Thanksgiving together at home. 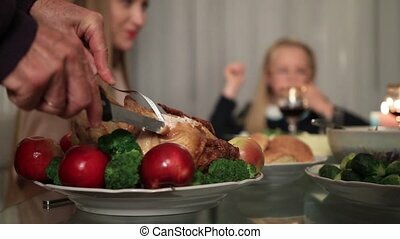 Close up of senior male hand carving slices of roasted turkey with apples and broccoli on platter over blurred family sitting at festive table decorated with candles background during Thanksgiving celebration. 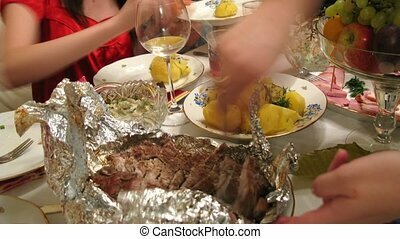 Big family sitting at festive table and having dinner on Thanksgiving holidays at home. 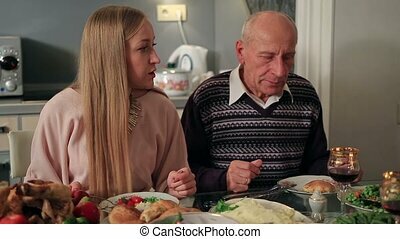 Charming adult daugther sitting with her handsome senior father and communicating with her family members while celebrating Thankgiving. Multi generation family preparing to celebrate Christmas together at home. 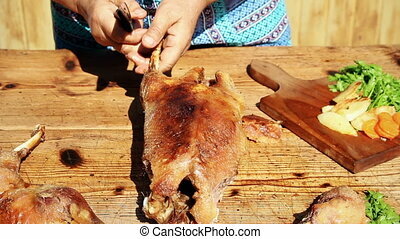 Mother chopping vegetable on wooden cutting board while talking to her dauther. 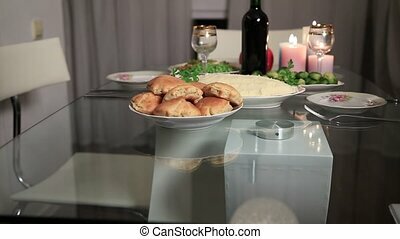 Grandmother serving table with delicious meal. Christmas tree with lights and decorations in the room. 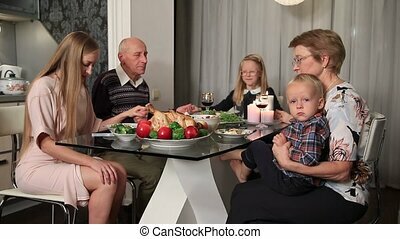 Happy family with grandparents sitting at the table in living room and enjoying Thanskgiving meal. 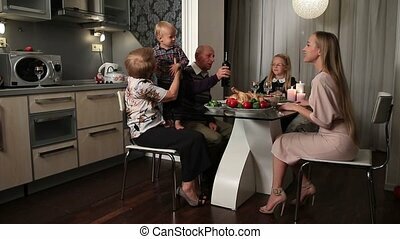 Grandfather pouring wine into glasses while grandmother holding her toddler grandson and communicating with her adult beautiful daugther. 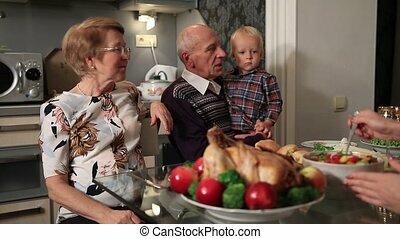 Happy family with grandparents sitting at festive table on Thanksgiving holiday at home. 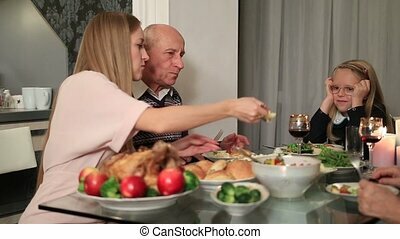 Cute granddaugther in angel dress serving peas to her grandfather and gently kissing him and her little toddler brother while granny talking with adult daugther. Multi generation family enjoying traditional Thanksgiving meal at home. Happy family sitting at the festive table served with delicious dishes and decorated with candles on Thanksgiving. Lovely mother serving meal to her cute little daugther. Happy family with grandparents and children eating traditional Thanksgiving food at the table. Multi generation family elebrating Thanksgiving dinner with turkey at home and chatting with each other. 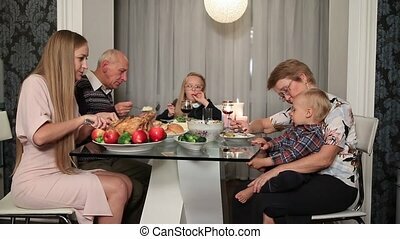 Multi generation family sitting down at festive table served with delicious traditional dishes to celebrate Thanksgiving together at home. Multi generation family members giving thanks to God at festive table while holding each other's hands. Beautiful blonde long hair woman saying prayer before thanksgiving dinner. Multi generation family serving Christmas table together. 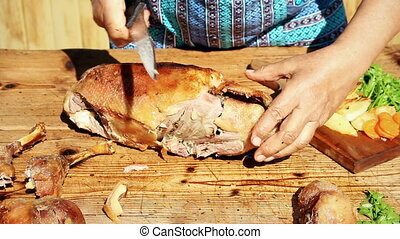 Grandmother teaching her granddaughter how to cut vegetables. 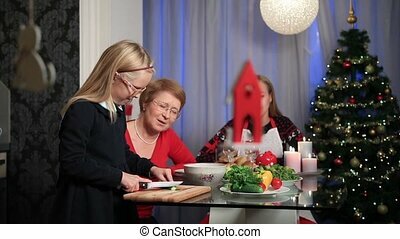 Girl cutting cucumber on chopping board and giving her lovely mother a slice to taste over Christmas decorations background. Cute little girl reciting Christmas poems to her grandmother while sitting on her knees. Three generation family celebrating Christmas together.